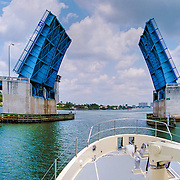 Cruising Florida's Amazing Intracoastal from Miami Florida, Dodge Island. Intracoastal Waterway is a 3000 mile inland waterway. This is southern Florida boating and Condominium buildings along the way. 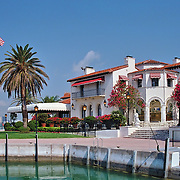 Fisher Island, Intracoastal Waterway, Port of Miami, Florida, Miami, Use the image SEARCH function to find more relevant photos and images.